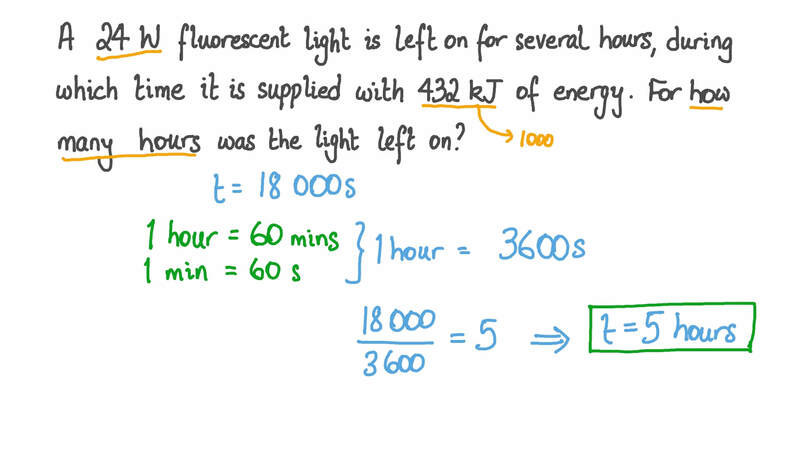 In this lesson, we will learn how to use the formula P = E/t to calculate the rate at which energy is transferred by a device given the amount of energy it transfers in a given time. A 24 W fluorescent light is left on for several hours, during which time it is supplied with 432 kJ of energy. For how many hours was the light left on? Which of the following is the correct unit for power? A 250 W television and a 400 W television are both used for two hours. 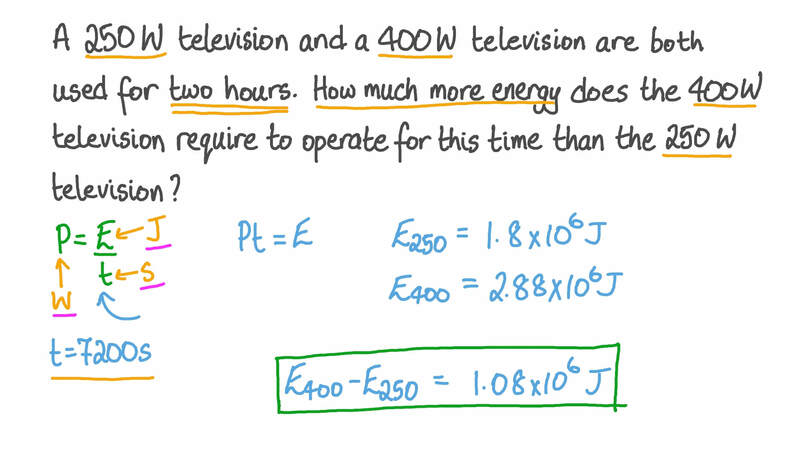 How much more energy does the 400 W television require to operate for this time than the 250 W television? A kettle is filled with water and turned on. It takes 3 minutes to boil the water, and the kettle is supplied with 3 2 4 0 0 0 J of energy in this time. What is the power of the kettle? A 30 mW LED in an electronic circuit is left on for 2 hours. How much energy does it transfer to its environment over this time? Assume that the LED is 1 0 0 % efficient. How many watts are there in 1 megawatt? What is 34 kJ in joules? Engy wants to find out how much electrical power her television needs when it is on. She watches television for a few hours and records how much energy has been supplied to it every half hour. The graph shows her results. How much energy has been supplied to the television after 3 hours? What is the power of her television? What is 6700 kilowatts in megawatts? Which of the following is the correct formula for the energy transferred, 𝐸 , in a given time, 𝑡 , for an electrical appliance with a given power, 𝑃 ? What is 50 MW in watts? A microwave is used for 5 minutes, during which time it is supplied with 180 kJ of energy. What is the power of the microwave? What is 24 MW in kilowatts? How many joules are there in 1 kilojoule? What is 5 0 0 0 joules in kilojoules? A 60 W incandescent light bulb is left on for 30 seconds. How much energy is supplied to it over this time? Which of the following is the correct unit for energy?